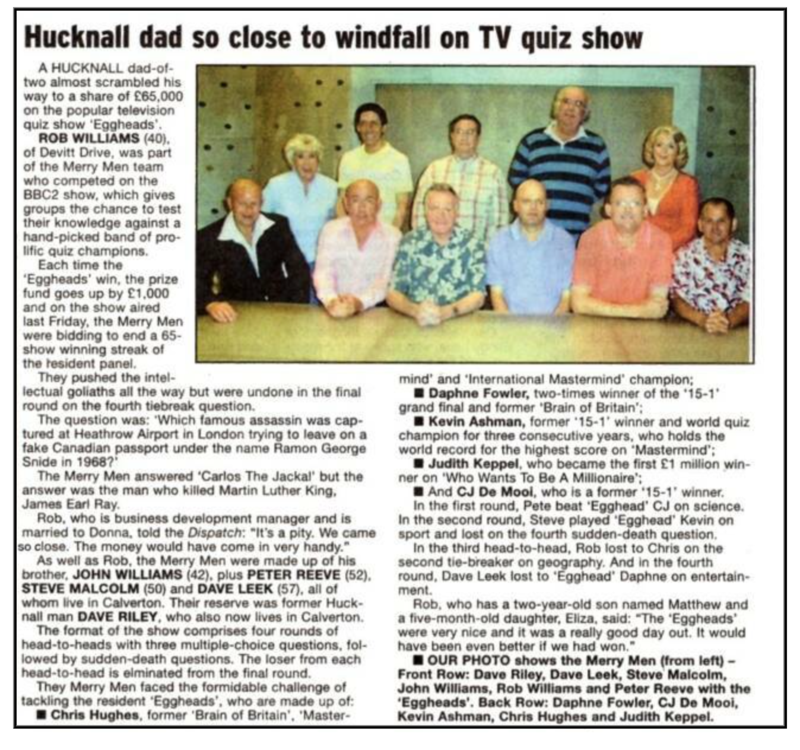 July 2007 six local lads, five from Calverton one from Hucknall, were invited to audition for the TV quiz Eggheads - They were Dave Leek, Steve Malcolm, Pete Reeve, Dave Riley, John Williams and Rob Williams. They had to travel to BBC Birmingham for the ordeal err trial. 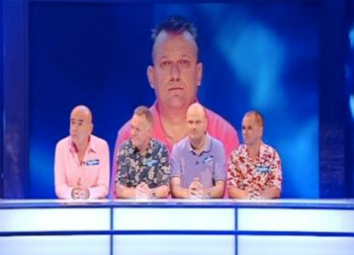 Twelve yard productions wanted all six members of the group to appear, but sadly Rob Williams couldn't make it as he was holidaying in Great Yarmouth at the time. The remaining crew went in absolutely atrocious driving weather. Arrived a bit early in Birmingham, err three hours early to be exact, what to do? Dave Riley had a great idea 'Lets find the nearest pub' he said. Two and a half hours later we made our way to the studios. When we got there, complete with breath fresheners, we found that the audition consisted of our team up against three other sides from all over the UK. The main difference was that they all had six members and we only had five - this must have been a huge negative mark for us. Name badges were handed out and an empty seat was labelled Rob!! The first round started - this consisted of ten questions, on all kinds of topics, to be filled in as quick as possible within two minutes. These were handed in but no scores were given - although most of us thought it was a "Cakewalk"
Then came the main contests - First up was History - All four teams had to select someone to play - Pete was selected for us. He duly lost on the deciding 'Sudden Death' round. Next up was Arts & Books - John was sent up to play he actually won his deciding 'Sudden Death' round - One point to us!! Next round was Sport - Steve went up and he also won on the deciding 'Sudden Death' round - Two points to us!! Then came Entertainment - up went Dave Leek to play - he also lost on the deciding 'Sudden Death' round. 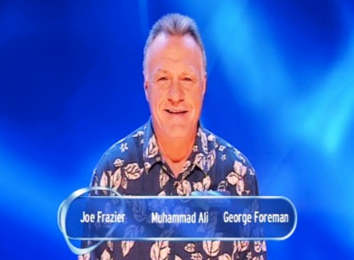 Next up the greatest ever audition bar none. Dave Riley went up to take Science and Nature, One of the questions was so funny - 'In 1945, What was invented by Percy Lebaron Spencer?' 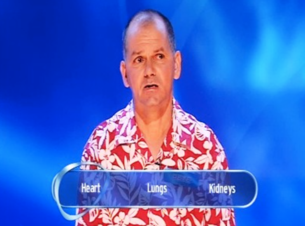 Options were:A) Condensed milk B) Cats eyes or C) Microwave oven - Dave proceeded to do an impression of Major Charles Ingram but there was no coughing!! Eventually he plumped for the Microwave and was vindicated for his long-winded "Speech" by getting the answer correct. Unfortunately Dave also lost on the deciding 'Sudden Death' round. At this stage the team was losing 3-2. The last game was next, but we have no player! The wonderful researchers allowed us to play a member again, so the team nominated John. 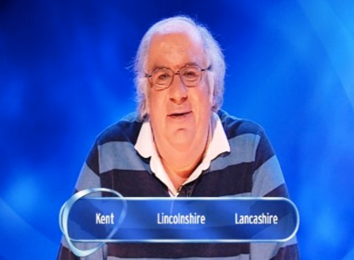 The subject was General Knowledge - John won in a "hack canter" and so the final audition score was 3-3 with the two other teams scoring nothing a piece! We then had to do a screen test, all five members in front of the camera, one at a time, answering questions in sequence. The questions were 1. 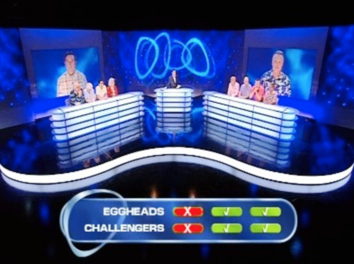 Which Egghead do you like best and why? and 2. Who, past or present, would be your ideal dinner date companion and why? Dave Leek answers 1. Humpty Dumpty - he cracks me up and 2. Charlton Heston because when I was a young boy I loved his pictures the escapism and all that, brilliant. Dave Riley 1. Daphne - I love her! and 2. Daphne - I've already told you I love her! Steve Malcolm 1. CJ - He is so modest and 2. Isambard Kingdom Brunel - Steve then rattled on for 5 minutes!! John Williams 1. Chris - I could wile away the hours with him talking about trains, pure Heaven and 2. Marilyn Monroe - I'd like to err..............................ask her what really happened that night. Pete Reeve 1. Kevin - just so clever and 2. Beyonce because you never know what might develop at the end of the night!! 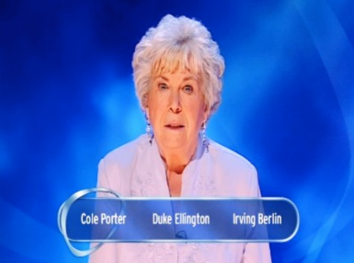 Nearly three weeks later we all had letters saying CONGRATULATIONS we'd been shortlisted to appear on the SHOW. (Apparently the mail was delayed due to the Royal Mail strikers!!) We got these letters on a Monday and the following Thursday we got a phone call asking us if we could come down to London to record a show the next Monday - Talk about short notice!! We accepted immediately, so long as we could play the final game of the day, as four of us were working that day!! We are told - in the letter - to take with us three different types of shirt. But, no polka-dots, stripes, blue, black, white, creamy and definitely no logos - bang goes most of our wardrobes. 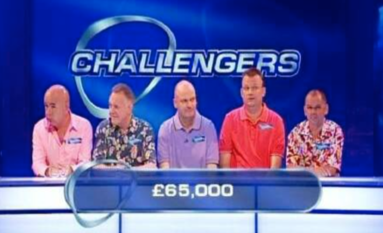 Although Dave Leek has a wonderful collection of Hawaiian/Thomas Magnum shirts - so we thought we'd take a load of those as well as some coloured ones. 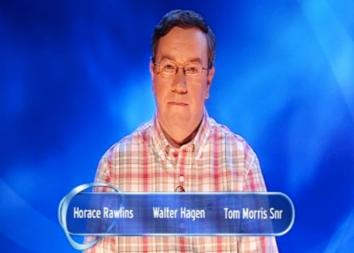 We decided to go straight for the jugular, Steve had been earmarked to play three times World Quiz Champion Kevin Ashman on Sport and Dave Leek was to be pitted against multiple Fifteen to One winner Daphne Fowler on Entertainment. 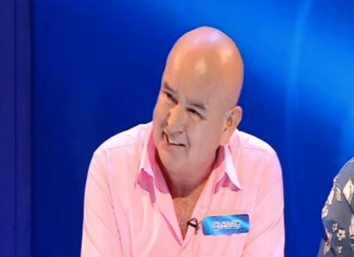 Pete would take Connagh-Joseph de Mooi (CJ) on either Science or History and Rob would just have to take whatever subject was remaining against International Mastermind champion Chris Hughes. We decided then to make our way to the BBC studios as we had to be there by 4pm - we arrived a bit early....err 3pm!! Lounging around at reception we checked ourselves in at the desk - One of the research team came down and took us through to the Green Room for a coffee and a few snacks. We checked the clock only another 45 minutes to go! The clock ticked on, 10 minutes to the off, Steve said that all the knowledge he had in his head had suddenly vanished!! Researchers/Production Assistants Laura and Jason arrive and take us to the briefing room. All the shirts are laid out for the Fashion gurus to peruse over and pick what would look best on us. 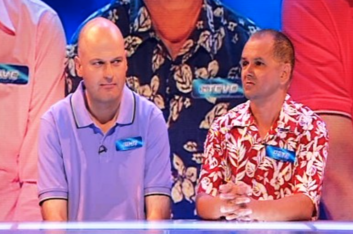 John and Rob get "normal" shirts but Steve and Pete are both told to wear one of Dave Leeks flower-power shirts! Dave himself gets to wear his own snazzy pink number. After the briefing of what is expected on the show, we are taken to the make-up room. Then we are taken to the dressing room where all of our individual shirts are hung up - freshly ironed - waiting for each person. Researcher/Production Assistant Laura comes in and says we all look beautiful. Yeah right? 6.20pm time to go on set. The first thing you notice is how dark it is in the studio - 'watch out for cables we are told' - We all take our places on set on our panel. Dave Riley, our supersub if anyone was suddenly ill, decides to try out Dermots seat for himself - swinging away as if he owned the chair! First things first we all had to record our intros before the compere even arrives - Dave Leek went first and promptly made a pigs ear of it many times - this may appear on Aunties Bloomers in the future! All recorded ready to roll. 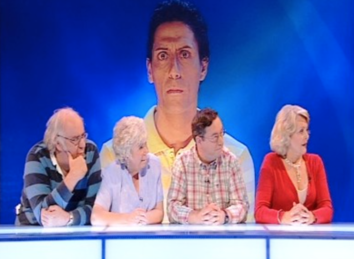 Eggheads walk in the studio, look over at us and suddenly Daphne is waving to Rob, 'cooee hello' she says - Rob looks mystified. 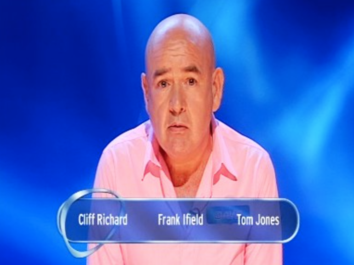 CJ says 'not bad lads £1000 each if you win' Chris says 'Don't forget its only a game' errmmm. Dave Leek then said that they probably recognized us from a different show as we had appeared on one programme many many times. 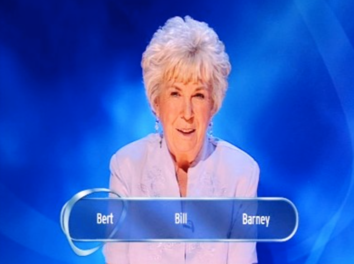 Judith Keppel said 'Really? and what was that?' Scouse Dave seized his chance brilliantly 'Crimewatch!' he chortled. The joke just went straight over Judiths head she didn't bat an eyelid. All of a sudden out of the darkness a shady figure appeared. 'Hi Pete' the fellow said shaking Pete's hand. 'Who are you!' 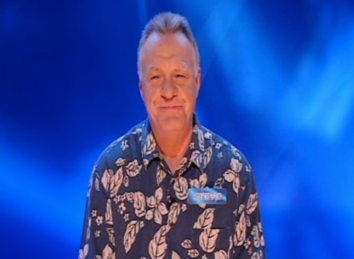 Pete stated ........ 'err I'm Dermot the quiz compere!' He duly shook all of our hands and wished us good luck then the match was about to commence. Dermot: 'The prizemoney stands at £65000! 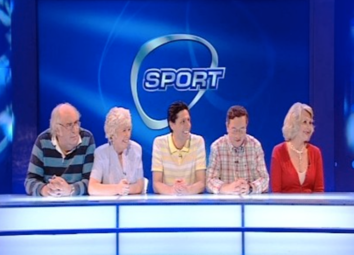 Dermot: 'The first subject Merry Men is Science who would like to play and against whom? 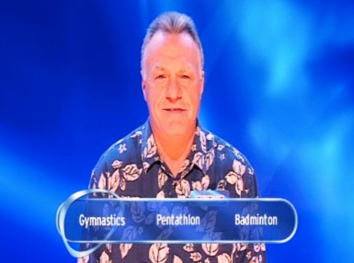 Dermot: Devonian? 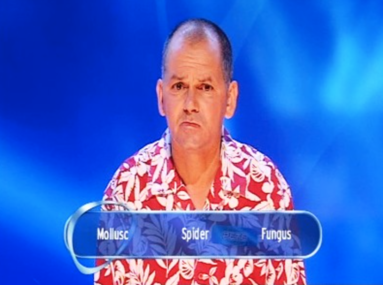 Which is great news for you Pete its the wrong answer its Triassic. 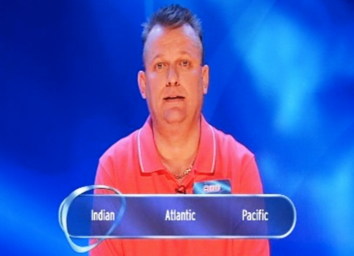 Pete you're through to the final round to play for £65000. Would you both please come back and join your teams. 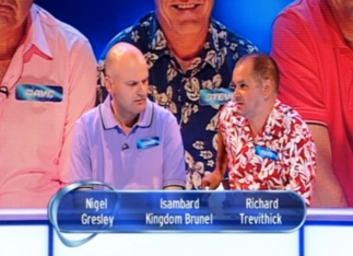 Even though they are playing for £65000, John and Rob are both laughing. Anybody that knows Steve knows why! Dermot: ' Numbersixvalverde? Certainly a Grand National winner but was it 2007? Steve its incorrect it was a longshot. 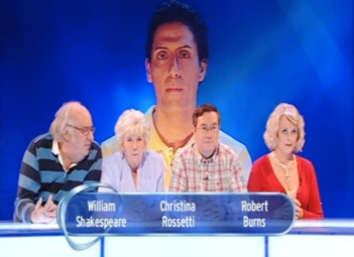 At this point none of the Eggheads knew - but magically in the final edit Daphne got the correct answer of Silver Birch!! It was as if Marvo the Magician had lent a hand!! 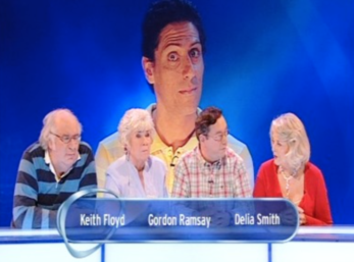 The next four questions were cut from the show due to the complete lack of time. Point: Jai Alai may indeed be an alternative name to Pelota but if that was given as the sole answer then it should have been deemed wrong because Jai Alai means "Merry Festival" in the Basque language and not ball!! 'Rob your question. The island of Martinique, in the Caribbean Sea is an overseas region of which country? 'OK Dave your question. Delilah and Its not Unusual were UK hit singles in the 1960's for which singer? 'How are you going to do with this one? Here it is. What is the subtitle of the third film in the Pirates of the Caribbean series released in May 2007? 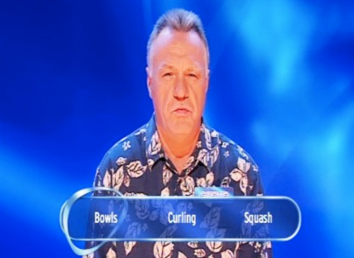 'Dave, second question for you. 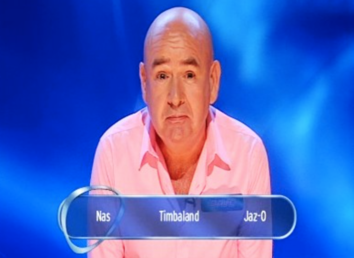 Len Goodman and Bruno Tonioli are Judges on which TV show? At this point Pete and John want to answer the question before the options are read out!! Point: "Stranger on the Shore" was the first-ever recording to be number One simultaneously in the UK and USA, although there is a slight dispute over the UK charts, as there were so many different charts. The Guinness Book of British Hit Singles states it was Number Two, whereas Twenty Years of British Record Charts states it was UK Number One. 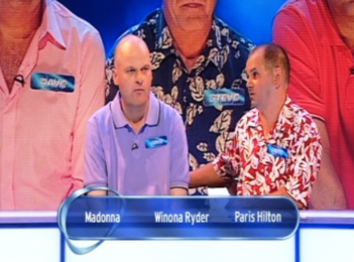 John and Pete think the answer is so obviously not B and C but they cannot remember what option A was. 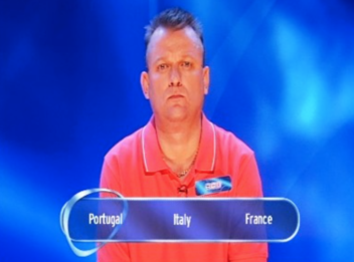 They ask Dermot to repeat the options. 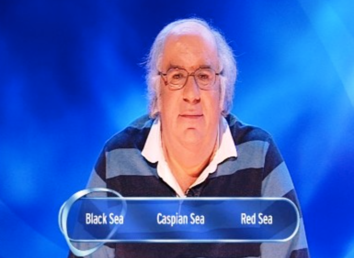 He says 'There they are in front of you on the monitor' - Now John and Pete have got 19/20 vision not 20/20 and both couldn't make out the first option. They just manage a squint at the monitor! 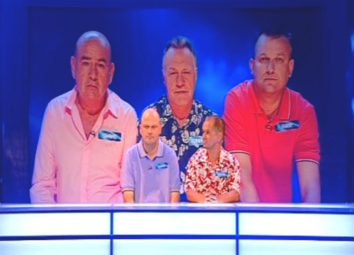 As with Steves match the next four questions were cut from the show due to the complete lack of time. 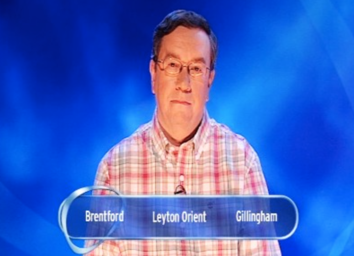 The 'Sudden Death' score should now be 'three-three' and not 'one-one' as was seen on the actual broadcast. Dermot at this point holds his finger and thumb about a millimetre apart! That was it game finished. Afterwards we all met up with the Eggheads to discuss the game. Dermot shot off as quickly as he came on, saying goodbye to all of us individually, on the way!! What immediately came to the fore was how nice and pleasant each of them was, nothing like their on-screen persona!! In fact CJ came across as the best of the bunch, although Daphne ran him very close. CJ organised this photo, below using Daphne's 'Super-Duper' top-of the-range camera, please note that some team members were still sporting make-up! Conclusion: A great time was had by all of our team through a very long day. The 12 Yard Production team looked after us superbly. Especially Laura and Jason who both so wanted us to win, it was untrue!! 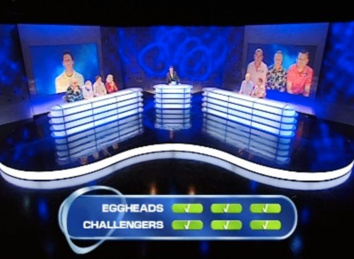 We ran the Eggheads a lot closer than the final broadcast would have you believe. 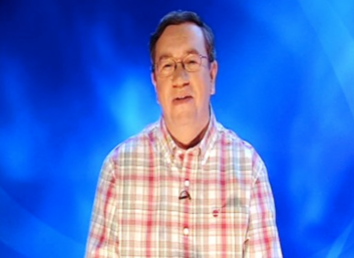 Indeed Steve Malcolm took the three times World Quiz Champion to four 'Sudden Death' questions before eventually bowing out (this one round could have possibly filled the whole 30 minutes - of the broadcast by itself!). Rob Williams did especially well on a subject that was forced onto him, Geography. Dave Leek was just unlucky with his questions - Had he had Daphnes set of posers he would have made a better fist of it. And Pete Reeve? Well anybody that knows him just knew he was spinning his game out!! 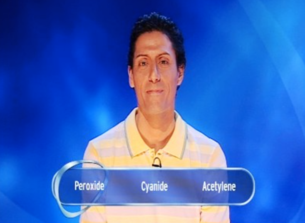 He could beat any "Quizzer" on Science and not even break sweat. John Williams, according to Steve, wasn't given the chance to show how good he is. Although John said that result wouldn't have been affected so its all water under the bridge. 8.10pm is the time and the train back to Nottingham is booked for 8.55pm!! After the biggest train dash in history the team just manage to get on the train at St Pancras at 8.53pm. Onto the train and Dave Riley, Dave Leek, Rob and John Williams find a "Double-seat" err right next to the buffet!! At 10.15pm after err a "few" drinks the bar had ran out of beer!! Now who could have drank all that? Dave Riley, Dave Leek and the Williams brothers say it can't be them as they've only had seven 500ml cans each!! Arrived in Nottingham 10.45pm - Dave Riley has an idea - 'Lets go into the Bentinck Hotel for a pint.' Three pints later kicked out 11.20pm - Back in Calverton 11.50pm. Four Postmen had been on the go from 5am. Straight to bed and up at five! !